Michele's Little World: Give your home a touch of "You"
Give your home a touch of "You"
I've always dreamed of owning my own home! However, it's currently not in my cards to own as of right now. That doesn't mean you can't decorate your rental to give it a personal touch of "you" to make it feel like home! 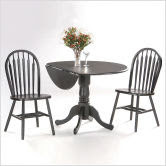 While browsing diningroomsdirect.com I fell in love with several of these gorgeous drop leaf table choices! I especially love the discounts and FREE SHIPPING offers on each product they offer. Shopping for furniture and other items for your home can unfortunately, become stressful! Especially when choosing products on a budget. The following table for example is $197.99 which gives a discount of 25% ($67.01) and don't forget that it ships FREE! The particular table above offers and attractive discount, right? By browsing the other drop leaf table selections, you can clearly see the discounts can be quite generous! How about this one for example? 52% off sounds lovely, doesn't it?! Diningroomsdirect, does offer a large variety of products perfect for decorating your home to give it that personal touch it needs. Why not make your home comfortable and inviting not only to others but, more importantly? Yourself?! 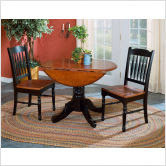 Give your dining room a splash of excitement with a brand new drop leaf table from diningroomsdirect.com! DISCLAIMER: I will receive a small gift certificate for sharing this information with my readers. However, what I have posted is my own personal and unbiased opinions. I hold no responsibility between you and the company nor the products.